Huatli excelled at exactly two things. She was a knight, and she was an orator. When demonstrating either, she shined brighter than any other knight in the Sun Empire. She had never needed to be anything else. And she was certain that finally her emperor would bestow the title of warrior-poet upon her after all these years of ladder-climbing and preparation. "Let me see it again," her cousin whispered. Huatli opened her saddlebag. A glint of steel winked back at the two knights. Inti peeked into the bag, the ghost of a grin on his face. "It's hideous." Her cousin was maddeningly even-tempered. Huatli had learned over the years how to quantify his enthusiasm, and inferred from his two-word sentence that he was over the moon with pride. "Whoever made it was clumsy, and the one wielding it was even clumsier." Huatli smiled. Their final victory had been an easy one. No deaths on either side, only superior martial skills and a very convincing offer. The Legion of Dusk had retreated to their ships without weapons or pride. Huatli looked around the plaza as she and her cousin passed under the arch at the entrance to Pachatupa. Some attendants were setting up for the homecoming ceremony later that day. Some other citizens were purposefully walking across, but by and large the plaza was empty. Only the two knights' mounts (two bright-eyed clawfoots) seemed to care about their presence. Huatli's dinosaur tugged at her reins, eager to get to the stables for a meal. 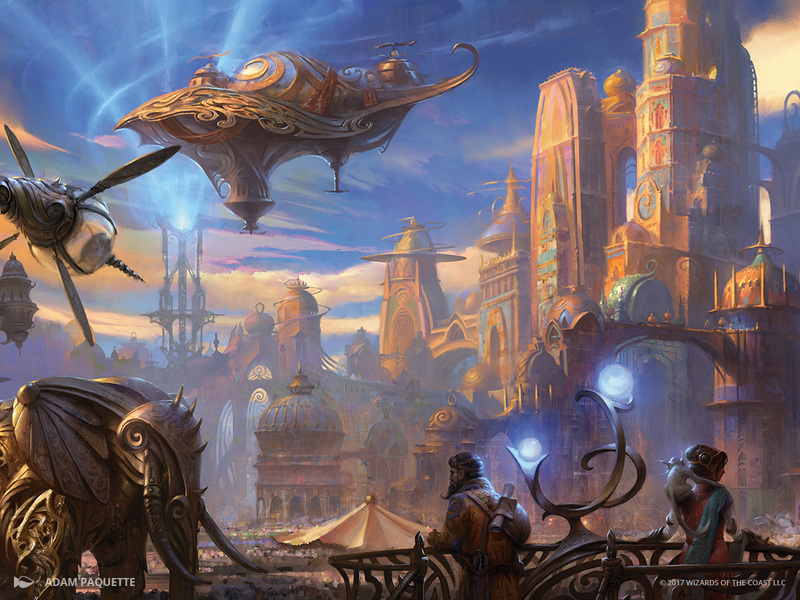 Huatli and Inti were returning from the Sun Empire's last major campaign on the Sun Coast. Most of the army had already returned, but their squadron had been delayed by one final battle against the Legion of Dusk. And, like all well-earned victories, this one had yielded many spoils all its own. Inti held out a hand, and Huatli passed him the stolen sword. He rolled his wrist to test its weight and handed it back. "You should have seen their priest," he said. "Hierophant? Eww. Anyway, he had fingernails like grandmother's." Huatli gave an exaggerated nod and an emphatic hmm. "The facts line up. Given the evidence, it is more likely than not that Granny is a vampire." She turned to Inti and counted each piece of evidence on the hand not holding her dinosaur's reins. "No appetite, vacant stare, still alive despite all odds—"
Inti smirked. Huatli smiled in turn. The two had grown up together, had gone from battling each other with sticks as children to battling enemies of the Sun Empire as adults. Inti tapped Huatli's shoulder. Several people were walking toward them with happy, expectant looks on their faces. Huatli waved farewell to Inti. "Huatli! Welcome home!" one of the strangers called. Huatli smiled and bowed her head in recognition. A girl no older than thirteen broke from the group and ran up to her, eyes wide and breath short. "Warrior-Poet, are you delivering an oration at the homecoming ceremony?" Huatli hated when people did that. Assumed she had achieved something she hadn't quite yet. "I am speaking today, but I'm not the warrior-poet yet. What is your name, friend?" "Wayta. I saw you speak at the last equinox festival . . . you were amazing." "Do you write poetry, Wayta?" The girl looked down, visibly embarrassed. "It's not good enough to share." Huatli bent down so the rest of the small (and growing) crowd wouldn't hear. "Would you like to know a secret?" Wayta looked at Huatli in wonder. Huatli gave her an honest smile in return. "There are only two types of poems in the world. Poems that are good, and poems that are honest. Poetry that is good is clever, and anyone can be clever if they try hard enough. But poetry that is honest has magic in it; the ability to let other people feel what you feel is a very powerful magic indeed." Huatli continued. "If you think your work isn't ready to share, don't try to make it good. Try to make it honest." And Wayta grinned from ear to ear. An hour later, the homecoming ceremony began, and Huatli patiently awaited the moment of her entrance. While their mission had been small, it represented the end of a larger endeavor to rid the Sun Coast of invaders. To mark this joyous occasion, the Emperor would be speaking to all citizens of Pachatupa, and Huatli would be expected to deliver an oration. The title of warrior-poet was bestowed to only one person in a generation. They kept the stories and weaved events into words. To earn that title, one must demonstrate excellency in service to the kingdom. Such responsibility ought to have weighed heavily on someone as young as she, but Huatli was not so easily pressured. All residents of the Sun Empire respected their emperor, but all residents of the Sun Empire loved their warrior-poet. This was surely the last speech she would give before the emperor bestowed the title of warrior-poet upon her, and Huatli wanted nothing more than to prove herself worthy of such admiration. There were no set qualifications to earn the title of warrior-poet, but the emperor's growing trust in her seemed to signal that the announcement was coming soon. 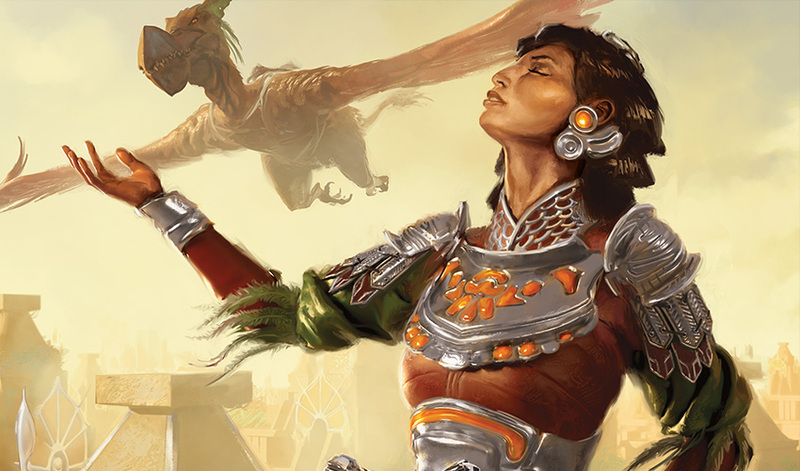 Huatli could sense it in the air like the tang of metal before a storm. Huatli rolled out her shoulders and inhaled the musty air. The dinosaur beneath her shifted from side to side, anxious to leave the dark shadows of the stable. Huatli lay a hand on her dinosaur's rough hide and willed her to be still. Wait, she urged, sending the scent-memory of food through the connection between her and the beast. The dinosaur stopped its shuffling as soon as it sensed the promise of a treat. Huatli patted her on the neck. The beast ruffled her feathers and then stilled herself with cold-blooded simplicity, ready for Huatli's next command. Huatli would be called out to speak at any moment. Huatli never worried about performing anymore. She only worried if she had performed enough. The air of the stable was stuffy and warm. Distantly, she could hear the emperor's voice echo as he spoke to the citizens of Pachatupa. All who lived in the city would be attending the celebration. Perhaps he'll announce it after my oration, she thought. Perhaps today is the day he announces that I have done enough to earn the title the city already attaches to my name. A figure peeked around the post of the stable and locked eyes with Huatli. He wore the markings of a priest—one of the organizers of this homecoming ceremony—and nodded at Huatli. You can do this, Huatli reminded herself. Her dinosaur cawed in shared excitement. She squeezed her mount's sides, and the clawfoot took off out of the stable. The sun was hot as a forge, and the cheers of the crowd were more deafening than any dinosaur's roar. Thousands of Sun Empire citizens parted to clear the way, applauding Huatli's approach. The city around them shone with amber and the light of the noonday sun. The crowd gathered in the plaza had been facing the Temple of the Burning Sun to hear the emperor speak, but now they all turned to cheer Huatli as she rode at a gallop toward the great stairway that led to the dais. Huatli's dinosaur ran in a spear-straight line through the parted crowd, underneath archways tall enough for long-necked dinosaurs to pass through uninhibited, and over tile strong enough to withstand even the heaviest of spinetails. Up ahead, Huatli could see the emperor standing at the top of the stairs to the Temple of the Burning Sun. His hand was outstretched in welcome, and even from a distance, Huatli could make out the broad smile on his face. The crowd began to chant her name. 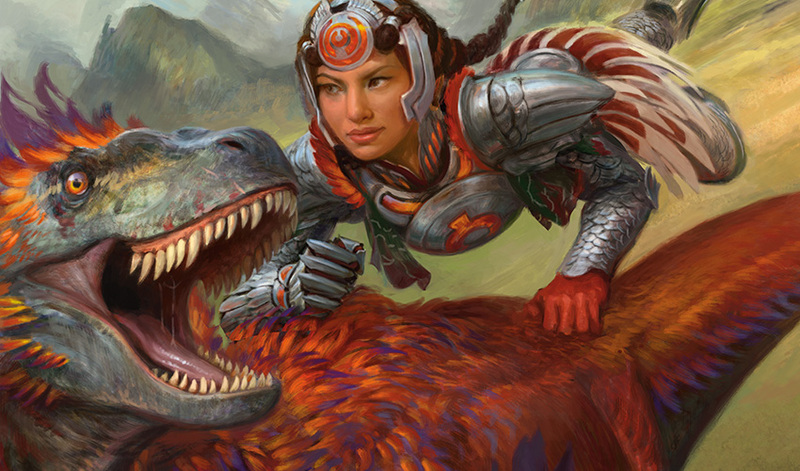 Huatli beamed, and she sensed that this was the right moment to pull out her prop. She held aloft a captured sword, and the crowd cheered twice as loud. The thing was flimsy and thin, meant for quick stabs rather than smooth cuts, and a tacky black rose was welded to one side. To think that these inferior craftsmen thought themselves conquerors. 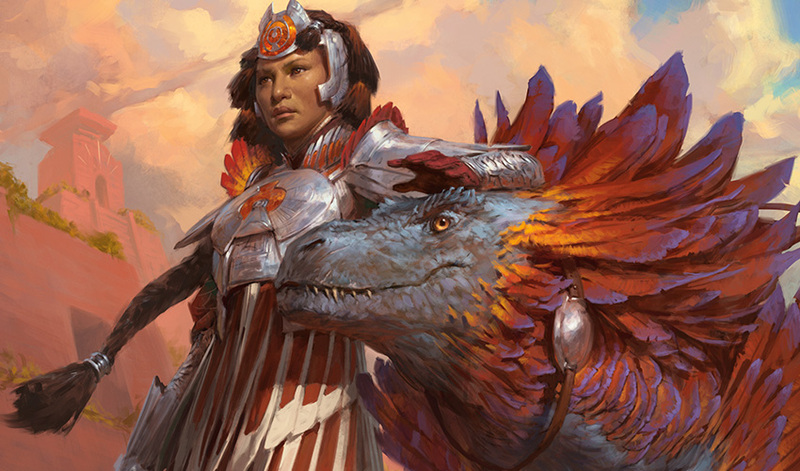 Her dinosaur stopped in front of the temple steps, and Huatli dismounted, sword still held aloft. She looked up to her emperor and ascended the stairs to the temple. The temple itself had been built on the foundation of an older temple, which had been built over several ruins even older than that. The Sun Empire itself was much the same. It was the latest iteration of a land whose rulers were constantly vying for power, building on top of the old and reaching ever higher with the new. Whereas the River Heralds had once controlled the continent, under the leadership of its new emperor, the Sun Empire had cemented its grip on the land. Apatzec Intli III was responsible not only for the new assertion of control, but also for the current mood of expansionism that had gripped the empire following his mother's death several years before. While the prior emperor had busied herself with conservative busywork, the new emperor yearned to prove himself as the bringer of a glorious new age for the Sun Empire. Huatli had never met the prior emperor, but she admired Apatzec's determination. He first became aware of her as she moved up the ranks in his guard, and after years of devoted service she had become his most trusted tactical advisor. At the top of the stairs, Huatli turned and presented the Legion of Dusk sword to the crowd below. They cheered at the display of the spoils of war. Emperor Apatzec approached, flanked by priests on either side, and Huatli gave him the sword. He clapped Huatli on the shoulder with a smile, and addressed the people of Pachatupa in the plaza below. "Citizens! I give you the leader of the squadron that successfully deterred the invaders of the Sun Coast. She and her warriors deterred the Legion of Dusk from our shores, and just this morning returned safely home. My words cannot do her victory justice. Listen, and mark the valiant grace of Huatli!" Huatli smiled, held out a steady hand, and lowered her palm with practiced ease. The crowd quieted, and she quickly cast a spell to bring her voice to a commanding volume. Just like you practiced. You can do this. That would darken all our days. To the heathens on your shores. That hungers for your birthright. Soon their vileness fled our shores. Your Empire is the light. Like the rising of the Sun." The crowd roared with applause again. Emperor Apatzec looked at Huatli with an approving grin. The emperor stepped forward and spoke at a volume enhanced by the slight haze of magic. "Today's small victory also marks the beginning of the next stage of our expansion." The audience quieted. This was important news. Does he mean to grant me the mantle now? "Driving the Brazen Coalition and the Legion of Dusk from our eastern coast means that we are ready to reclaim the south," Apatzec announced. He spoke with the practiced diction of a ruler and the confidence of a conqueror. "Our warriors have never been more prepared, and with the strength of the Burning Sun, we will banish the Legion of Dusk from our mainland!" The audience cheered, and Apatzec nodded at Huatli. Her heart sank a bit. If there were ever a time to announce her new title it would have been now. She waved a farewell, turned, and followed the emperor into the temple. He motioned for the other priests to depart, and shrugged off his ornamental cloak. Huatli took a seat on a cushion in the center of the room. He sat across from her and smiled. "Thank you for sharing your gift, Huatli. Our empire needs your voice." "I am happy to be of service, Emperor Apatzec." He turned over the Legion of Dusk sword still in his hand and held it aloft, a look of displeasure tugging at his nostrils. "Gaudy, isn't it?" he noted. "One wonders how they conquered an entire continent with these." "They used their teeth too, sir." Huatli flashed a broad smile. "Unfortunately for them, ours are much sharper." The emperor smiled at Huatli. She sat silently, waiting patiently for him to speak. Apatzec told her the last thing she expected to hear. "I am not sending you to fight in the south." Huatli tried not to show she was hurt. "I was promised one more mission before I would earn the mantle of warrior-poet." she asked, arranging her face into a neutral expression. Emperor Apatzec solemnly shook his head. "I knew you'd hate the idea." "I don't hate the idea," said the woman with a firm-as-steel grip on her own hand. "The Sun Empire needs you here, in Pachatupa. There may still be invaders yet arriving on our eastern shores." "Do you know something I do not?" The emperor frowned. "Only rumors. But I fear a twofold attack by both Brazen Coalition and Legion of Dusk in the near future. You and your squadron will continue to maintain a presence on the coast and deter whatever invaders come while our army is fighting in the south for the next month. You will depart next week for your mission." The emperor paused and sighed. "I hate what my mother's instructions would have been." "'Protect the cities and continue the search for the one we lost,' I imagine?" Apatzec nodded, with a smile tugging at the side of his mouth. "We would sooner find a flying panther than an entire lost city. It is best to focus on what is real, Huatli. What we can see and hear. Chasing ghosts will only lead us in circles. Prepare your squadron, and be sure to write another good poem while you're gone." Her heart leapt. She was still in consideration after all. Apatzec bowed, and Huatli bowed in return. A month later, Huatli caught wind of a rumor. Scouts reported that a Brazen Coalition ship had appeared just off the coast. Huatli saddled up her mount and bounded into the jungle alongside Inti as soon as she was able. Flowers towered overhead, and packs of long-necked dinosaurs parted as the two warriors passed on their clawfoot mounts. "Reports said they were camped near the outcropping," Inti yelled over the pounding of their dinosaurs' feet. Vines whipped Huatli's armor as she tore through the jungle. She sat up in her saddle and began a spell to summon some assistance. She felt her magic alight within her, a little beacon that radiated from her chest. Seconds later, she heard the patter of trotting, two-legged dinosaurs on every side. Within moments, a trickle of dinosaurs had begun riding behind Huatli and Inti. Small egg-eaters were joined by platetails and frillhorns, all of which moved with a sense of purpose, sticking close to the Sun Empire knights' mounts. Huatli instructed the herd to keep following, soothed them with her magic, and assured them they would not be harmed. "Huatli! Ahead!" Inti was pointing to a clearing ahead where the delta of the river began to meet the sea. Bright red sails formed an angry mark against the blue sky, and a large pile of crates and supplies were stacked on the beach. They came to a halt, herd and all, just inside the thick cover of jungle where the trees met the sand. Huatli and Inti looked out at the ship with anticipation. "No crew," Inti remarked, keeping his voice low. Huatli nodded. "They must be surveying. I'll destroy the equipment, you flush the pirates down the beach and toward the boat when you see their supplies light up." "Sounds good," Inti said. He looked at Huatli and nodded. "Stay safe, cousin." Inti took off into the jungle, and Huatli urged her mount out onto the sand, instructing the remaining herd to stay behind in the jungle. The dinosaur padded silently on the sand, and in a moment, Huatli was positioned near the pile of supplies. She uncorked a flask from her hip and poured its sharp-smelling contents over the boxes of supplies. She then pulled a small dark stone from her armor and struck it against the steel of her blade. Sparks flew onto the dry wood of the crates, and almost instantly they caught flame. Huatli stowed her blade and ran back into the jungle. She halted where she had begun, at the hidden divide between beach and jungle. A few of the crew were emerging now, panicked by the sight of smoke rising from their rations and gear. But not enough of them were running. Chase them onto the beach, Huatli urged, eyes alight with magic. The jungle rustled, and a dozen human-and-ogre-and-goblin Brazen Coalition voices screamed as the summoned dinosaurs flushed the remaining crew out onto the sand. The pirates emerged, stumbling and blinking, into the light, only to yelp in surprise at the bonfire before them. They ran forward in desperation, and began whacking at the flames in an attempt to put them out. Huatli grinned and spotted Inti in the distance. She whistled, and he trotted over. They were hidden from the view of the pirates by thick coastal trees and ferns, and he pulled his mount close. "We're good here," Huatli said, nodding to the panicked crew already trying to get back to their ship. "Go ahead and scout for freshwater. I could use a drink." Inti turned and took off ahead into the jungle. Huatli nudged her mount to a trot and began making her way along the edge of the beach. Suddenly, something yanked the feet out from under Huatli's clawfoot. Huatli hit the forest floor with a bruising thud. 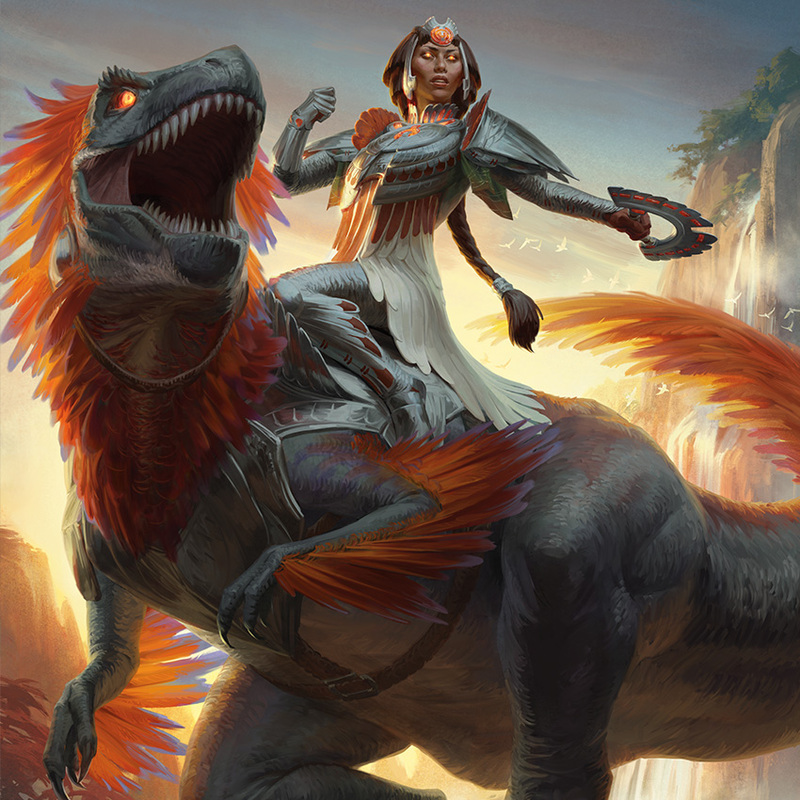 Huatli scurried to her feet just in time to see her dinosaur, feet bound in red-hot chains, cry out in pain, its scaly legs scorched by the heat of the bindings. The source of the chains came into view, and Huatli gasped with fear. Emerging from behind a tree was an immensely tall monster. He had the body of a blacksmith, but the head of an animal that Huatli had only seen around Legion of Dusk forts—a bull? Heavy iron chains were wrapped around his chest, and he seemed to glow from within like a furnace, a steady flow of steam rising from his snout. Huatli dove toward the chain in a desperate attempt to help her mount, but her foe snorted in defiant fury as he pulled the chain back from the dinosaur's leg. The metal lifted on its own, then shot out again, wrapping itself around the crying dinosaur's neck. He snapped the chain tight with a sickening crunch, and the beast died instantly. Huatli leapt to her feet and drew her weapon. She did not bother to hide the disgust on her face—she had known this mount for years. Any monster that would act with such cruelty must surely suffer the consequences. "What is your name?!" she yelled. The beast held out his hands. The searing chains snaked back from the dinosaur's legs to around his arms, coiling at the ready for another strike. An unnatural fire burned in the beast's throat, and steam rose from his nostrils. 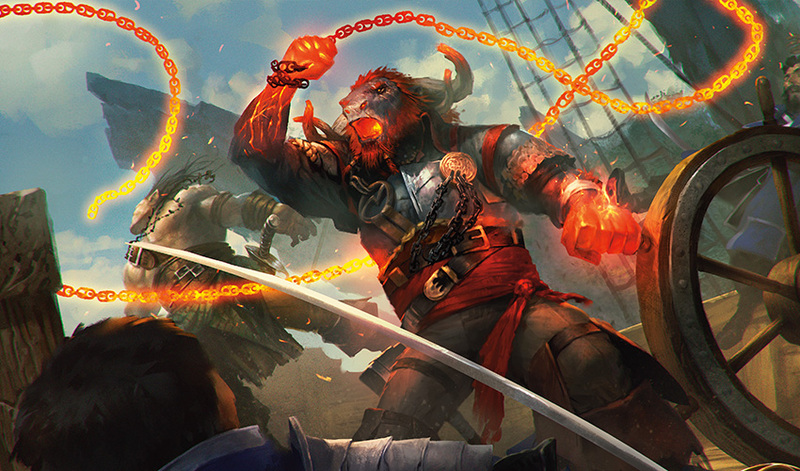 "I am the dread pirate Angrath," he said, "and I seek the Immortal Sun." Huatli laughed out loud. "You and everyone else, fool." His voice had an accent Huatli could not place. "If you will not tell me where the Immortal Sun is, knight, then you will die." A chain shot out from his right arm. Huatli dodged it, feeling its heat as it passed her face. Huatli caught her balance and ran toward Angrath, blade at the ready and muscles tensed. She tried to close with him, her semi-circular blade striking low and seeking his tendons, but the pirate burned with a searing heat that was too much to bear at close range. She backtracked, kicking up a spray of dead leaves and dirt as she dodged the chain. She had backed off just in time to avoid another blow from a chain. A second chain flung out and snagged her foot, and Huatli was yanked to the ground with a ferocity that knocked the air from her lungs. The chain was white-hot, and she could feel it even through the denseness of her steel greaves. She bent forward, swinging with all the force she could muster to try to break the chain with her blade. Angrath casually walked forward, a furious fire alight in his eyes. Huatli struggled and shifted, and thankfully, the chain came loose. No pirate fought with this kind of callous rage. No River Herald would kill with such disregard. And no Legion of Dusk foe was so unpredictable. Huatli felt off-kilter and out of her element, for this foe was unlike any other. Huatli whipped her head around. Inti must have turned back when he heard the commotion they were making, and was staring back in horror from the thick of the jungle. Angrath turned his head to mark the newcomer, and Huatli hurled herself upright, rushing in for the attack. Blade tight in one hand, she kept her weight forward, sweeping her leg low, out, and away, to knock the pirate off-balance. It worked—Angrath hit the ground in a hard thud, and as he tried to stumble to his feet, she sliced a clean line across his chest with her blade. The bull-headed man roared in pain and launched another length of chain directly at Huatli. She kept her weight light, dancing her weight from foot to foot, and dodged the attack with sinuous ease. Huatli followed the momentum of her parry, allowing the energy to carry her weight to her other foot, and landed a sharp high kick to his chin. Angrath buckled, and Huatli called out to Inti, who was watching open-mouthed from the side. "Inti! I need a mount!" From behind her, she sensed Inti begin to summon a new dinosaur for her to escape on. She saw a red-hot chain fly toward her from somewhere on the ground, and dropped low to the ground, sweeping her leg and shifting her weight to avoid the flinging chain. One of her greaves fell off in the process. Inti yelled, "Behind you!" just in time for Huatli to be struck from behind, falling face-forward into the leafy forest floor. Angrath was back on his feet, scowling as much as his face would allow. Huatli heard a yell and watched as Inti was yanked from atop his mount. A second chain suddenly wrapped around the exposed skin of her own leg, and she screamed over the sizzle of flesh. She suddenly realized this was how both she and her cousin would die. She tried to stand and face her foe when something deep within her chest sparked. Suddenly, without pain, Huatli began to feel herself coming apart. Her vision burst into a miasma of color and light, sound rushed through her ears, and she felt her body begin to break away from itself. It was bright and warm and should have been frightening, but it felt like the most natural thing in the world—she felt her head pass forward, deeper into the color and light, and she saw. It was a city that shone with the warmth of gold. Bright, shining towers and spires that stretched into the sky. Glimmering metal unlike any she'd seen before, and above it all, pulsing magic that flowed through the clouds like a river. Her perception was yanked sharply back, as if some unseen force was pulling her backward to the jungle. Whatever door she peered through had slammed shut, barred her from entry. Everything was flying again through color and light, sound and noise, until her body rearranged itself on the forest floor. Huatli's blood pounded, and her vision settled on a strange triangle-and-circle symbol hovering with a strange glow above her head. She tried to catch her breath. Her fear solidified, and she stopped gasping for air. Then she realized Angrath was still in front of her. He was staring in wonder, chains snaking back to his arms and eyes wide with bovine shock. Inti was dazed, but alive, also staring at both Huatli and the shining symbol fading above her head. The pirate held out his hand and pointed at Huatli. "You're one too!" Huatli put a hand on the ground to balance herself. The sigil above her head vanished. She shook her head. Words dribbled from her mouth without grace or full awareness. "I don't know what just happened." Angrath was grinning as much as a bull-headed man could grin. "I've never met another one on this wretched plane! We can help each other leave!" Inti had gotten back on his dinosaur and quickly looped around to stand behind his fellow knight. "Huatli, get up!" Inti said, holding a hand out to her. She ignored it, staring in shock at Angrath. He, too, was reaching out to her, palms up in an invitation. She quickly sliced at Angrath with her blade, climbed on Inti's mount, and they ran as Angrath's pained yell echoed through the jungle. Huatli's mental dialogue was an endless whirl of curses and confusion. This was no time for a pleasant imaginary argument. This was a time for breathless questions. Inti verbalized as many questions as she was thinking. "Your body! That was magic! How did you do that? Have you been training secretly?! And what was that symbol? Why did the pirate think you would help him?!" Huatli's response was tangential, brief, and hushed. "I saw a golden city." "Inti . . . I think I saw Orazca." Everything Huatli thought was true about the world around her felt like it was coming apart. Not only had she been attacked by the strangest beast she'd ever seen, but her body had dissolved, and for one moment, her consciousness peeked into an open window only to be pulled back to her own world. It was like trying to stand on a log in the river. Like she was a child spinning in circles and falling to the ground. The ground had left her feet, and Huatli's belief in what was real was upended. Night fell as she returned to the city, and Huatli made her way directly to the emperor's residence. She needed counsel from the one person she knew would not tell a soul what she had seen. The guards recognized her immediately, and ushered her into the tallest building in Pachatupa with a deep and respectful bow. Their formality put Huatli further on edge. An attendant led Emperor Apatzec into a formal meeting space. A carving of the sun dominated the largest wall, moonlight glinting off amber embedded in the stone. The emperor looked composed as always, though his usual cape of dinosaur feathers was absent and a less formal robe had taken its place. "Huatli, what brings you to me at this hour?" Huatli's heart was still pounding a bruise against the inside of her chest. "I saw something I did not understand." "A dream?" said the emperor. His sour face betrayed the opinion he held regarding dreams. "No. I would not believe it myself if I had not seen it with my own eyes." The emperor lifted a hand to his mouth in thought. "Tell me what happened." They sat, as friends would sit, and Huatli recounted the incident as best she could. He occasionally sipped from the cup of xocolātl he had summoned when he sensed this story would be a remarkable one, and nodded with understanding at each turn in Huatli's tale. "What did it feel like?" he asked. "It felt like I was not allowed to leave. Like I had opened a door, but could only peer my head in before being sucked back." "Something was keeping you from leaving? And only Inti and I know what happened?" "'Apatzec,' please. I don't have the cloak on." Huatli gave him a tired look. The emperor shook his head and smiled. "You are remarkably brave, Huatli." "With all due respect, Emperor, I do not feel it." Emperor Apatzec sat down his cup and gave her a thoughtful look. "The Sun expresses itself in three aspects. Creativity, destruction, and sustenance. Your gifts have been lit by the first two, and it seems as if you must explore the last." "Sir, what do you mean?" The emperor seemed excited. "My mother was stubborn and old-fashioned. She would rather chase fables in the jungle than secure her power through active means. While I do believe it would be foolish to send our entire army to chase after the power that lies within Orazca, I do not believe it would be unwise to send our most talented knight, especially when destiny summons her anyway." ". . . Emperor . . . ?" "What you saw is proof of your worthiness to hold that mantle. Huatli of the Sun Empire, the golden city you saw can only be the lost city of Orazca. You must go and find the means to bring growth to our empire with the power that lies within." Huatli's hands were gripped in worried fists. "But the warrior-poet does not go on expeditions, your excellency. I was not meant to go on an expedition!" "But you did. Therefore, the warrior-poet does." Huatli gasped. Did he mean to imply what he had just said? The emperor stood, and walked to the other side of the meeting room. He pulled a helm down from a hook on the wall, and walked it over to Huatli. It was the helm of the warrior-poet. Huatli's heart began to race. Apatzec beamed with pride. "Huatli. The title of warrior-poet is yours if you can locate the Golden City of Orazca." Huatli let out a shaky breath. Everything she ever wanted hinged on finding a place more myth than reality. The emperor turned over the helm in his hand. The light from the lamps of the chamber bounced off the amber of the helm, dappling his face with a warm golden glow. "This is a new era for our empire. No other warrior-poet in our history has foreseen the Golden City." He flashed a broad smile. "That makes my rule a special one." Huatli grinned and rose to her feet. She straightened her shoulders and looked her emperor in the eye. "I will find Orazca, Emperor, and retrieve the Immortal Sun inside for the glory of the Sun Empire." Emperor Apatzec smiled in return. "Tomorrow is a new dawn for our empire, Warrior-Poet." The residence for the knights was secluded from the rest of the city by a modest wall. Here she and the other knights trained, ate, slept, and planned the defense of the city. Other regiments were devoted to conquest and the expansion of the empire, but here, the concern was primarily about protecting what the Sun Empire already controlled. Huatli had grown up here, to loving parents who had been knights before her. This was the only home she had ever known, and Huatli had memorized its corners and passages. She slipped through one of these passages now. Inti was looking around the corner. His stern brow was knit with concern. "Did you tell the emperor about what you saw?" Her cousin, at a loss for what else to do, nodded in return. "That's . . . good. Are you doing all right now?" Huatli shook her head and shrugged her shoulders, a desperate conglomeration of gestures to reflect her emotional state. Inti took her by the shoulder and led her back to the warriors' common room. It was empty and quiet, the rest of the regiment having gone to their bunks hours before. He poured her a drink that smelled rich and sour and was unpleasantly milky in look. If it was good for the soul, as Inti insisted, Huatli was convinced that was all it was good for. Inti waited until she had sipped a bit and regained control of her breathing before starting to prepare a poultice for the burn on her leg. "Are you sure of what you saw earlier today? When you . . . did the . . ." Inti waved a single hand above his head, alluding as best he could to the event with the sigil from earlier. "I saw a golden city." She swallowed and glanced at Inti. He gave her a deadpan look as he smeared the poultice on her ankle. "You saw a golden city?" Huatli felt her cheeks turn hot. "Yes." Inti tied a clean bandage around the poultice and sat back, deep in thought. Eventually he broke his own silence. "Was it the Golden City?" Huatli gave him an apologetic shake of her head. "No one knows what Orazca looks like, so I assume it was the Golden City." Inti made a small tutting noise. He wrapped the extra bandage in his hand. "Did the emperor tell you to find it?" "He told me I will gain the title of warrior-poet if I can locate the city." He let out a long breath and nodded. "That is quite the reward." Inti sat back down on the stool. Huatli thrust out her foot and sat before him. He began to unbandage her ankle, revealing the healed skin underneath. All of Inti's practice in medicinal magic had done him good. Huatli took a deep breath. "Inti, this is a kind of responsibility I've never dealt with before. I don't want to go alone." "You don't have to," Inti said. "You can take Teyeuh and I. We'll get you there safely." "I don't know how to get there?" The statement, again tainted by trepidation, came out as a question. Inti shrugged with a knowing look. "The River Heralds know. Why else would they be so zealous about retaining their territory?" Huatli's eyes lowered to the ground. "I've trained my whole life to earn this, but going on a voyage to a city more myth than reality wasn't part of the deal." "Do you want to go? Or do you just want the mantle that comes with your success?" he asked. The answer caught in Huatli's throat, and her gut reaction surprised her, but she gave voice to the thought nonetheless. "I want to find the city." Her heart was fluttering. The idea of explorer was a frightening concept, entirely alien to anything she ever thought she could be. And yet, she couldn't hide the excitement she felt when she thought about doing something other than what she was comfortable with. "I never thought I could be anything other than what I am, Inti. I want to be more than just one of two things." "You already are, cousin," Inti said, rising to his feet. "I'll find Teyeuh and let her know. We'll be saddled up to leave at sunrise to find a River Herald to guide us." He began walking toward the armory, paused, and looked over his shoulder. Huatli thought for a moment. "Warrior-Poet-Voyager?" she offered. Inti weighed the suggestion and countered with another. ". . . Warrior-Poet-Body-Dissolving-Expedition-Leader?" "They don't make a helm for that, Inti." "Not yet," he said with a smile. Inti departed, and Huatli was left alone. She was terrified. She was excited. She was faced with the most daunting challenge she had ever encountered. She wandered, after a while, to her bunk. As she lay in her hammock and looked upward, she tried to remember the color, light, and sound from earlier. She had felt each piece of herself brighten and break, and though she had seen herself dissolve, not one part of her had been frightened. Rather, Huatli remembered a feeling of elation in that moment. She drew a hand to her chest and closed her eyes, remembering how vividly and clearly the sun had shone against the gold of the city rooftops, how brilliant the rivers of blue and cloud had looked as they curved in the sky above. It was unlike anything she had seen before. She was not a seer, yet she had seen. She was not a voyager, yet her mission was to voyage. Huatli was two things, and neither seemed connected to the destiny that lay ahead. Huatli closed her eyes and calmed her busy mind. Her dreams were dappled with gold, shining with the colors of a place beyond her any she had ever seen. The dream shifted, transformed, became more prophecy than dream, and she saw herself as she would someday be. She was a warrior, and she was an orator. And now she was an explorer.